Experience two of Oahu's famous attractions with this tour package! 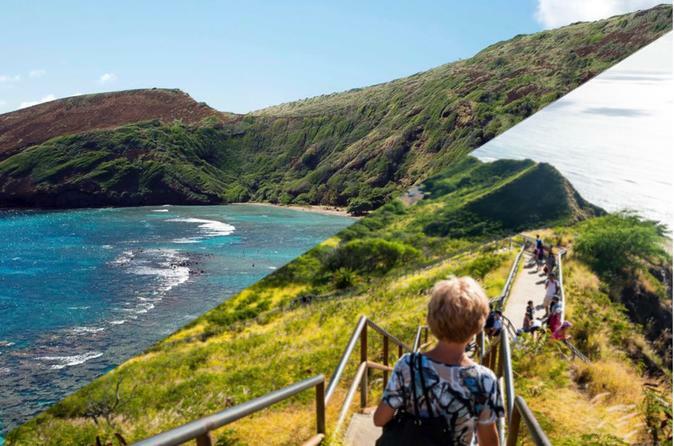 Enjoy the panoramic view at the summit of the famous Diamond Head Crater on a self-guided hike and then take an incredible snorkel excursion at Hanauma Bay. You’ll begin your tour by being picked up at your Waikiki hotel and taken to the Diamond Head Hike where you can enjoy the panoramic view of Waikiki, included in the shuttle will be a brochure of Diamond Head and a bottled water. This is a self-guided hike! After completing the hike, you’ll be taken to a refreshing adventure to Hanauma Bay, where the driver will provide you with snorkeling equipment. You will also need to pay a $7.50 state admission fee that is not included, the entrance fee is waived for children under 13, members of the active duty military (ID required), and for residents of Hawaii with proof of residency.